We are so very excited to begin the month of April with our fairytale study!!! We learned how to compare 2 versions of the same story. We compared The Little Red Hen, by Paul Galdone and another version from Reading A-Z. This amazing little smile is the reason why I do what I do!!! Max is a wonderful, 5 year old pre-k student, who just completed his very first Kindergarten math test!!! Go MAX!!!!! When we arrived in school on Monday, March 18th, we were surprised at our findings. A leprechaun had been in our classroom. One of our students made a leprechaun trap that we left on the carpet. The leprechaun apparently came in through the window and made a bit of a mess. He left us a note that you may read. Everyone knows that Friday is my favorite day of the week!!! Friday gives us all a chance to lack back and reflect on our week. We all spent this week working very hard on The Writing Process, and how to make our writing better. So on this wonderful Friday morning, the students walked in, and found a plastic egg with their name on it in a writing station. Their job was to open the egg, glue their question on the given paper and to really think about how they wanted to answer their question. We have really made great progress answering questions in writing!!!! How fun that this year the 100th Day of School also fell on Valentine's Day!!!! For the 100th Day of School, Mrs. Pollina's older intermediate group joined Ms. Mauro's primary class for a following directions activity. Each primary student was paired with an intermediate student and given a large white piece of paper. They had to work together to follow the directions give creating a 100th Day of School Monster. Each directions given was in a set of ten. Such a fun activity!!!!! We have been waiting for this day all winter!!!! During science, we read the story Snowflake Bentley and wanted to really get up close and personal with some snowflakes. We took black paper and went outside to catch snowflakes and observed their intricate beauty. We then came back inside to do a STEM activity where students to qtips and created their own symmetrical snowflake. No two snowflakes are alike!!!!!! Upon the return of Christmas break, part of the "assistants" job for the week is to go through the letter sound cards and sight words, in the teacher's chair each morning. Will is nothing short of amazing as he takes on the role as the teacher to go through our morning routine!!!! Great job Will!!!! This year we have incorporated "Mystery Science" into our science curriculum. Mystery Science is an interactive, online science program that the students and I find engaging and exciting. Why are polar bears white?, was a mystery that we unlocked and studied about camouflage. Our activity was to color a moth and hide it in the classroom. Check out how creative our students are!!!! We are so very lucky at New Suffolk School, to be able to pen pal write with our friends from Sagaponack school, in Sagaponack, New York. We have been communicating with our friends since September. We have Skyped with them and even went on a few field trips with them. What better way to start the New Year and month of January than with a Jan Brett author study!!! Jan Brett just might be my favorite children's author. We will continue to to spend the month of January exploring Jan Brett stories, comparing and contrasting them and learning about her craft as an author and illustrator. The students used their iPads during a center to scan QR codes and listen to various Jan Brett stories. So much fun!!!!! Colton used his iPad to scan the QR code and listen to the story The Mitten, by Jan Brett. Run, Run As Fast As You Can!!! Gingerbread was our theme for the month of December. As tradition, we invited our families to come into the primary classroom and listen to a story and decorate gingerbread cookies. We had a blast!!! Will and his dad, Mr.Fannon. We started off the 2018-2019 school year right!!! We explored the several phases of the moon and used Oreos to help us create the phases. Lydia and her phases of the moon. Colton and his phases of the moon. will and his phases of the moon. What a wonderful Groundhog Day we had! We spent time making predictions to see whether or not the groundhog was going to see his shadow and learned all kinds of fun facts about them. We ended our fun with making a groundhog mask and parading inside our school! Just some amaaaaaaazzzing poems by some amaaaazing students!!!!! How is Your Week 'Treating' YOU???? New Suffolk students are no strangers to working hard and working together!!!! Everyday, each student earns a chip for a job well done in math, science, and social studies with Mrs.Mauro. At the end if each week, the students count their chips and chart it. Exploring the Water Cycle ........In a Bag!!!!! We have been working really hard learning all about the water cycle and how it works. 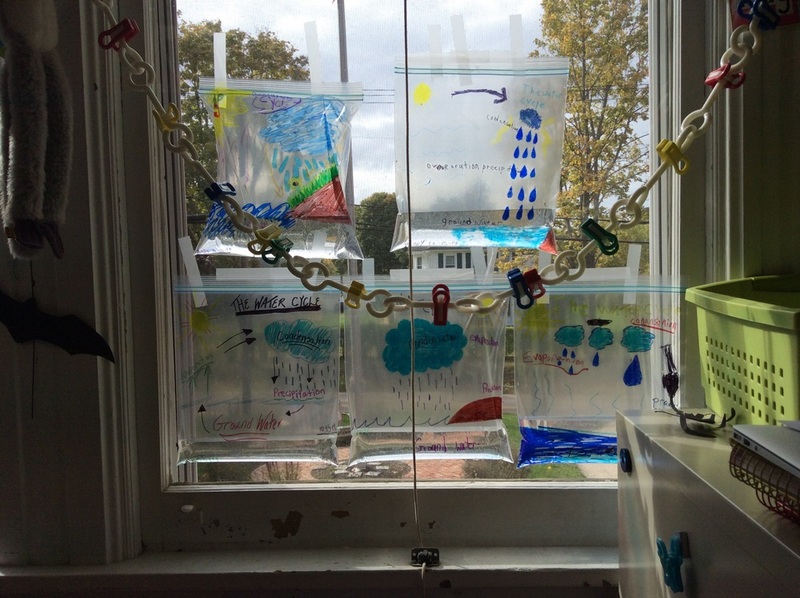 To "show what we know", we created water cycles in a bag. It is so much fun observing each day how much water has "evaporating!" October 20th-October 24th was Step Back in History Week, celebrated through the Southold Historical Society. The 5th and 6th graders had a wonderful time visiting the oldest cemetery on Long Island and doing some really awesome grave rubbings. 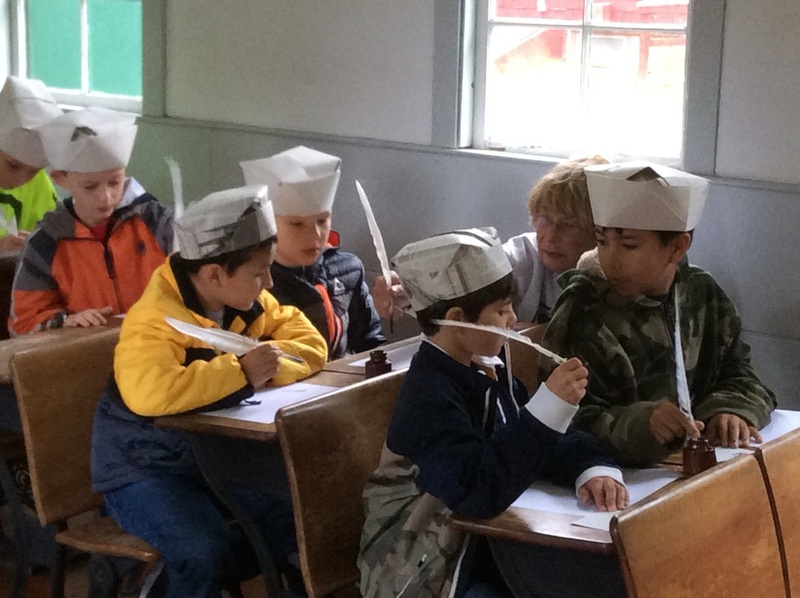 The 2nd, 3rd and 4th graders visited the old school house and practiced writing with a feather pen! Thank you again to the Southold Historical Society and our friends at Southold Elementary School for inviting us! Students getting started with their grave rubbings. October is "fire safety" month and our friends at the Cutchogue East School were so kind to invite us to join them for a fire safety demonstration. Thank you very much to the Cutchogue and Mattituck Fire Departments for taking the time out of your busy schedules to come and share your fire safety knowledge with us!!!! !